boAt BassHeads Nirvaana Bliss CE-1 ceramic earphones are designed to give you an experience which no other brand can match. It has an incredible sonic clarity with super extra bass. 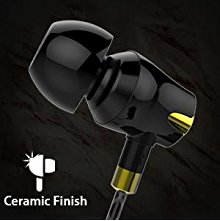 It is not a plastic earphone - It is purely ceramic. With tangle free superior coated cables, you are expected to be hassle free. As the headphones feature 8mm drivers, they give you clear sound with that powerful bass. In-built noise isolation mic ensures you don't miss those important calls. With exciting colors that match your style in your day, the boAt Nirvaana Bliss CE-1 ceramic earphones are the ideal choice for anyone who can carry that attitude. Just plug them in and plug into nirvana. Appease yourself with the boAt Nirvanaa CE-1 Ceramic earphones & take delight in listening to clean, unadulterated ornamental sound in a high-quality audio reproduction. boAt Nirvanaa CE-1 gives you an immersive listening experience that transforms everyday into something new. From the daily commute to the evening run, the wired earphones deliver outstanding deep and powerful bass for your active everyday life. The Sleek Ceramic Finish Nirvanaa CE-1 comes with an amazing amalgamation of style with protection which will never give up on you. These earbuds produce authentic sound, warm vocals and precision highs for a wholesome aural experience. It comes with Supreme Sound technology that ensures deep and powerful bass to take your music to a new level. Designed for the music lovers, the boAt Nirvanaa CE-1 Earphones comes with an amazing commixture of style with performance. The powerful 8mm dynamic driver housing with the speaker resistance of 16 Ohm ensuring a nearly flat frequency response with minimal harmonic distortion. The ultra-high definition 8mm drivers enables the earphone to deliver a punchy, natural soundstage & rhythmic response to the most demanding tracks. Feel the true ornamental sound at a wide frequency range of 20Hz - 20KHz, listen to the velvety-smooth mids & highs while the powerful Bass makes you feel the beats. You are definitely going to love it on your boAt Nirvanaa CE-1 for a long time. Looking for earphones that will complement your impeccable sense of style? You found them! With the sleek ceramic finish, the boAt Nirvanaa CE-1 Ceramic Earphones feels so stylish you may just put them in your jewellery box by mistake. Machined out of the earthly ceramic elements, the boAt Nirvanaa CE-1 embodies ultimate durability packaged in a lightweight, comfortable form factor with Mic and thus is easily portable. The material used to manufacture these earphones ensures its longevity. Now wear your attitude & get ready to turn heads wherever you go. What s more? Protect your Awesome Earphones with the perfect carrying case which you get with these amazing earphones. The boAt Nirvanaa CE-1 Ceramic Wired Earphones with Mic features a noise-cancelling microphone which enables trouble free receiving of calls or undeterred sessions of musical extravaganza. But there's more to these earphones than good looks--they also offer amazing sound, fit in your ears perfectly, and feature an inline remote and mic so you can control your music and your phone calls. 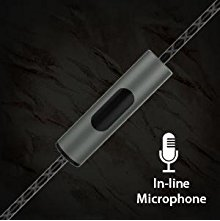 The microphone has a separate button to allow you easy functioning. Easily take calls and manage your music on any smart device. 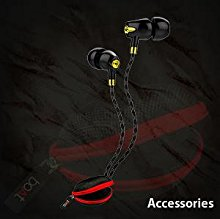 Play/pause music or answer/end calls with one-click, track forward with two-clicks, or back with 3 clicks make these earphones extremely user-friendly. Nirvanaa Duo comes with an amazing amalgamation of style with protection. To ensure additional protection from the threat of corrosion or damage, Duo comes with layers of superior tough wire coating. 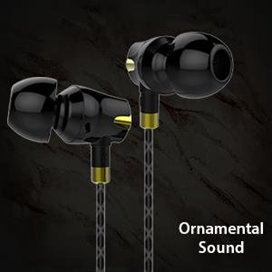 While the earphones are extremely user-friendly & stylish, extruding premium coating onto wire cable is a manufacturing process that we've performing and refining since our company's inception. Gold really comes into play when you are talking about higher signal levels, where signal loss would occur. The advantage of being remarkably resistant to oxidation, makes it a unique metal. It doesn't corrode, increasing contact area. Thus, reducing resistance. 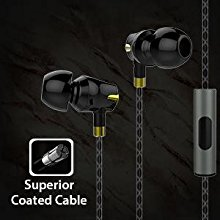 It is naturally more conductive than the ordinary connectors. The gold-plated contacts will allow you to pass the signal much cleaner.